For the official opening of the Kinderboekenweek (Children Book Week), we were commissioned to design and make an art installation for the Kinderboekenbal 2016 (Children Book opening festival). This year’s opening was held in the theater and concert hall Philharmonie in Haarlem. The theme of the Kinderboekenweek 2016 was ‘Grandfather and Grandmother’ with the playful tageline ‘Forever Young’. One of our first ideas was a lazy cat lying on grandmother’s lap. So why don’t we turn this idea into a big grandma’s cat where all the kids can be playing on it’s lap? So we ended up making a huge fluffy calico cat of 5 meters long and 3 meters wide. In Dutch we use the word ‘lapjeskat’ for the calico cat, with the playful meaning ‘patched cat’. 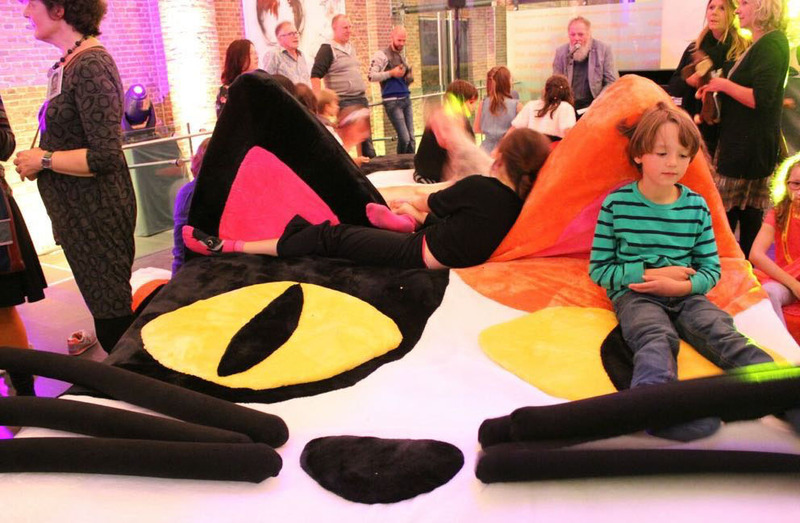 During the evening the giant cat couch was also a reading place for Dutch poets where the young visitors can relax and listen to the poems. 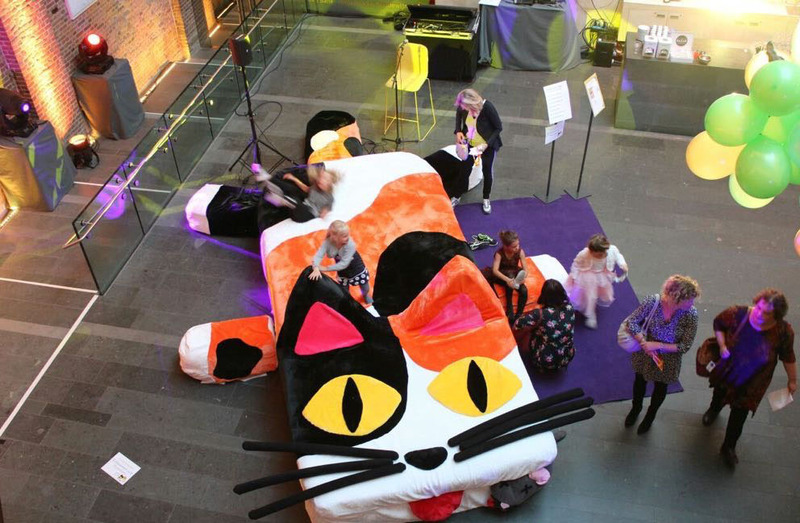 The giant fluffy cat was a huge success during the evening, within 30 minutes around 20 children playing/jumping/reading/relaxing on it, but the cat luckily survived the end of the evening. 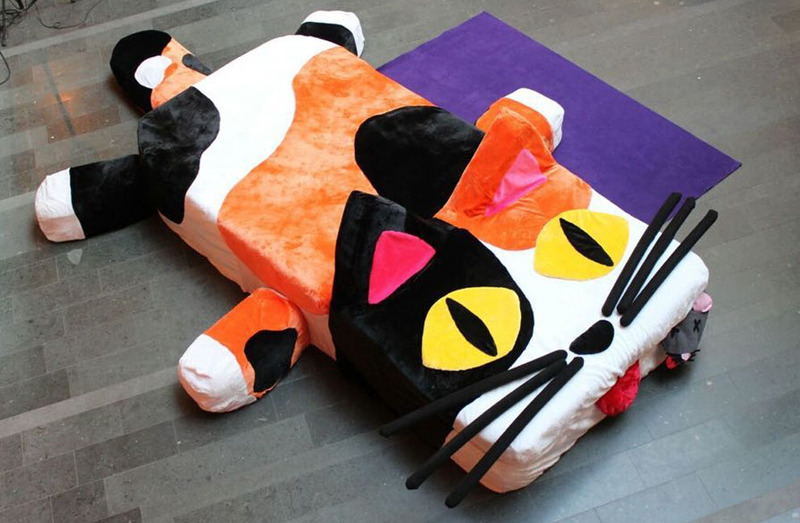 A week later the cat couch was also showed during the Camera Japan Festival in the film and music theater LantarenVenster in Rotterdam.